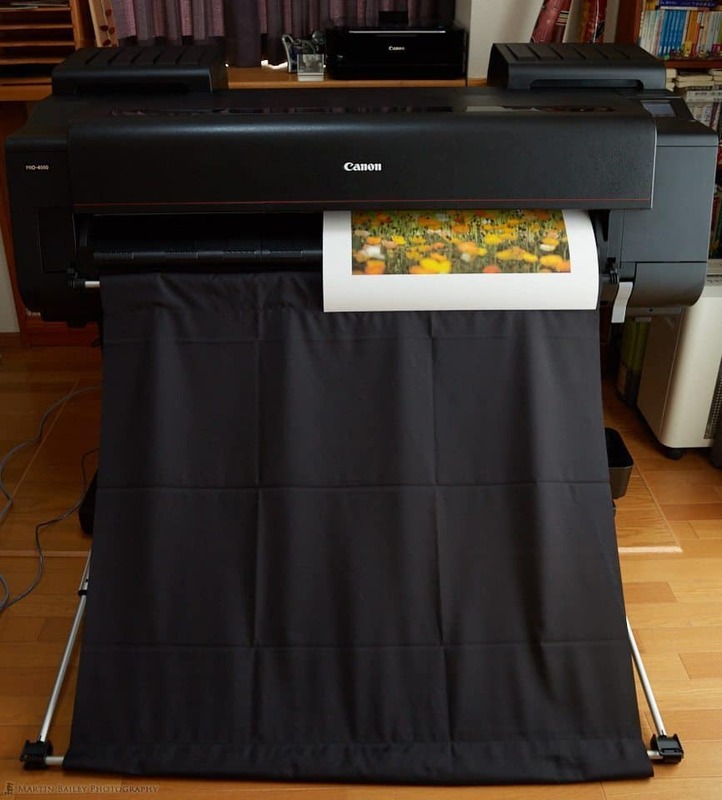 As I mentioned in a recent post, my old large format printer has given up the ghost, so I’ve just had a new Canon imagePROGRAF PRO-4000 installed, and today I’m going to walk you through some of the key new features and provide my opinion of this new printer. To be totally honest, with my old 24″ iPF6350 breaking after just six years, for a few seconds, I considered moving away from Canon for my large format printing, but then I realized that there was a new line of large format printers that has just been announced, so I decided to take a closer look, and was very excited by what I saw. 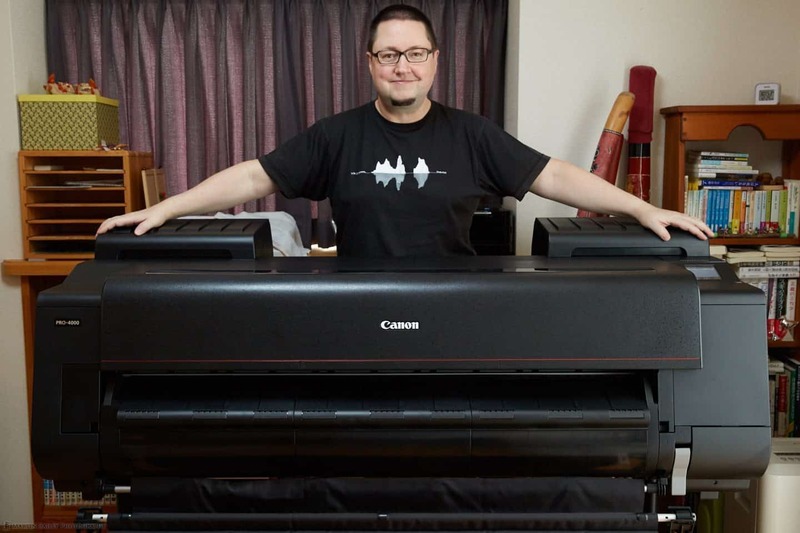 Initially, I was simply going to replace my 6350 with the PRO-2000, which is the successor 24″ wide roll media printer, but although this new range of PRO printers are narrower, they are more than twice the height, which means the PRO-2000 cannot be carried up to my 3rd floor studio. It simply will not fit around the top of the stairs, even stood on end. There was an option to have it crane lifted up to the third floor and go in through the window, but this was going to cost $1,500, and then of course another $1,500 to have it taken down again if I move, or when it inevitably breaks again at some point the future. I figured if I was going to spend another $3,000 I might as well put that money towards an imagePROGRAF PRO-4000, which is the 44″ wide big brother of the PRO-2000, and have that installed on my 2nd floor instead of up in my studio. And when I say big brother, I really do mean BIG, as you can see in this photo of me with the printer after having it installed (below). Before singing the contract, I went to the Canon S Tower here in Tokyo and made a number of large prints on three types of media, and I was very happy with the results. Note that I did my tests on the PRO-2000, before I heard the cost for the crane lift, but the 2000 and 4000 are pretty much identical except for the width of roll media that can be used. This also means that this review will be equally as useful if you are considering the PRO-2000 as it will for the PRO-4000. Anyway, my PRO-4000 arrived on August 9, and took four people to carry it up to the 2nd floor, and put it onto its stand. I have since spent the last five days setting it up, creating my ICC profiles, and getting to know this beautiful new larger format printer from Canon. 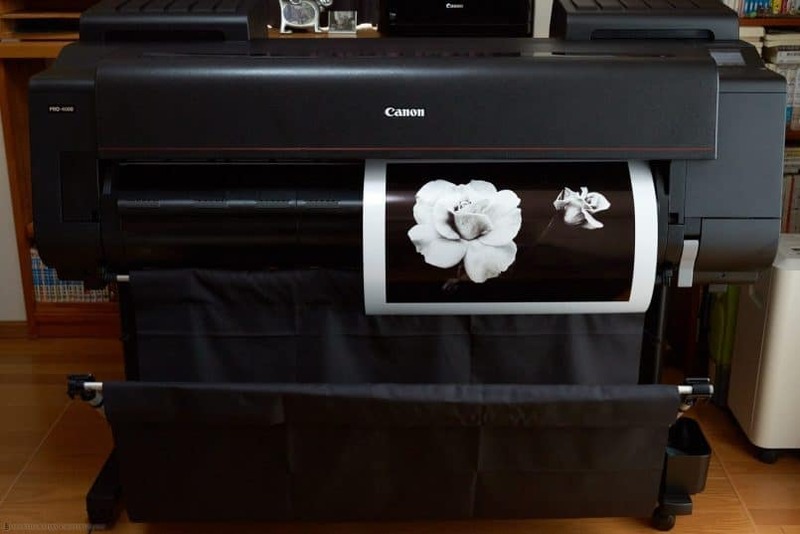 Before we look at some prints, let’s talk a little about what’s new with the PRO-4000. Well, Canon have released a new set of inks for this lineup called LUCIA PRO ink, which actually reduces the number of colors from 12 to 11 pigment inks, but they added a new Chroma Optimizer. The Chroma Optimizer is used when printing on glossy and semi-glossy media, and acts as a clear coat, improving color and enriches the dark areas of gloss prints. The new inks and Chroma Optimizer are also said to improve scratch resistance and reduce graininess. We’ll take a look at some actual prints shortly. I was also happy to find that the black line that was always left on the right underside of the prints is no longer a problem. That is something that bugged the hell out of my about my iPF6350 and I know that this was not fixed the 6450, so it’s nice that this is finally fixed. Whereas my old printer had two print heads, costing around $300 each, the new PRO printer lineup use just one, 1.28” wide print head with 18,432 nozzles and anti-clogging technology. This new print head costs around $500, so there’s a $100 saving when that needs to be replaced, assuming that you’d change both heads on the old models of course. Having just the one head also enabled Canon to make the printer narrower in width, which is a nice space saver. Having just the one print head also enabled Canon to speed up the printing considerably. An 18 x 24 inch print on my old printer used to take around 9 minutes, but with the new PRO-4000 the same size print takes approximate 3 minutes 40 seconds. The media loading mechanism has also been totally changed. You now load the roll from the front of the printer by opening the Top Cover and the Output Guide as you can see in this photo (below). 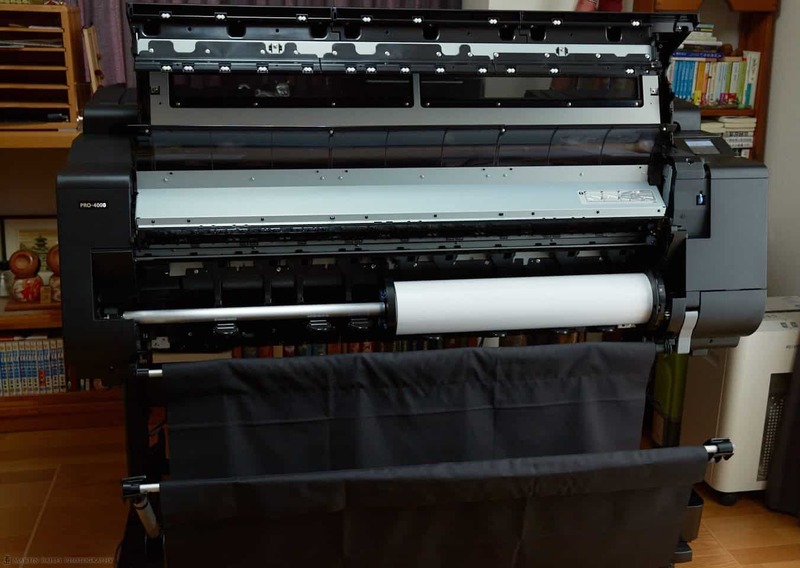 After dropping the media on its holder into place, you rotate the roll holder which guides the media up into the printer, until you hear a beep, to let you know that the printer can now feed the media. Then, you close the two covers and press a button the LCD display to tell the printer to go ahead and feed the paper. Not only does this mean we don’t have to touch the paper as much, we also now have the benefit of the paper being upside down for most of the time before it’s printed on. This is a benefit because it means that dust is less likely to settle on the print side of the media as you print, and dust that is already on the media, is more likely to fall off, before it’s printed on. If you print on dust, the dust generally falls off as the print dries, leaving a white spec, and for the quality conscious printer that means that the print has be created again from scratch. Another very nice touch that I’m pretty sure I could not do with my old iPF6350, is that you can update the Media Information in the printer drivers on other computers. Before, if I added a custom media type, like a roll of Breathing Color paper, to the printer, to get that same media in the drivers on a different computer, I had to use the Media Configuration Tool and add the media again. Now, you can just go to the printer drivers and open up the Printer Utilities, and select Media Information from the pulldown, and click the button to update the media. 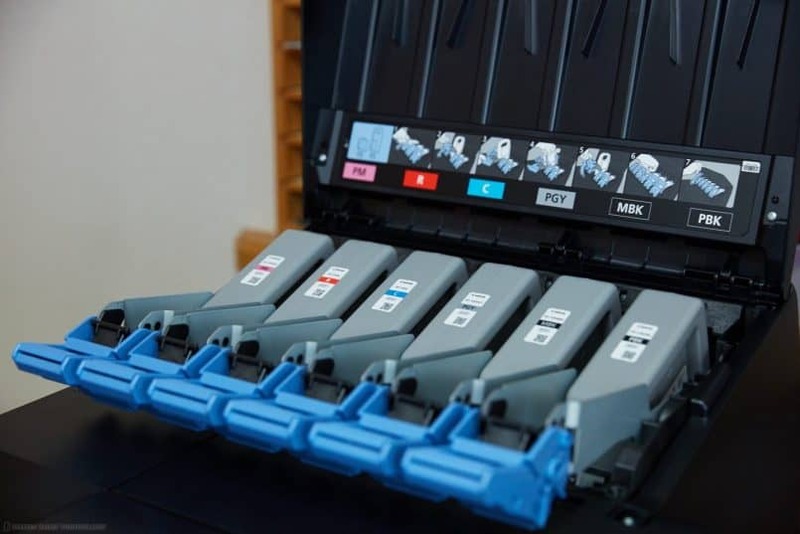 This then goes to the printer and compares the media information on the printer, and if it’s different to the media that the printer drivers know about, it will update this information for you. It’s very smooth, and a very welcome feature. The PRO series of printers now also supports Wifi Connectivity and the wired network interface is now Gigabit Ethernet. We can also still connect to the printer with USB. You can now print PDF and JPEG documents directly from a memory stick as well. I have now printed with Wifi, LAN and USB, and found Wifi to be a little on the slow side for a decent sized print, so I bought a 10 meter USB cable so that I can print from my dining table, which really speeded things up. Even though it’s only High Speed USB2, it’s much faster than Wifi. I also actually bought a 20m Ethernet cable, so that I can plug the PRO-4000 directly into my router on the 3F in case I need to do a lot of work from the studio. With USB being so fast, I don’t know I’ll do this often, but I at least now have the option. Another great improvement in my opinion is the ability to now choose from three sizes of ink tanks, with 160ml, 330ml, and 700ml tanks available. My old iPF6350 took 130ml ink tanks, so even the smallest of the new tanks holds 30ml more ink. I could fill up the new PRO-4000 with 160ml tanks, but now having the option to install larger tanks, and mix and match the sizes, means we can select the tank size based on how quickly the inks run down. The PRO-4000 comes with a set of ink cartridges holding 190ml. Before we installed the cartridges into the printer, I took this photograph for comparison (below). 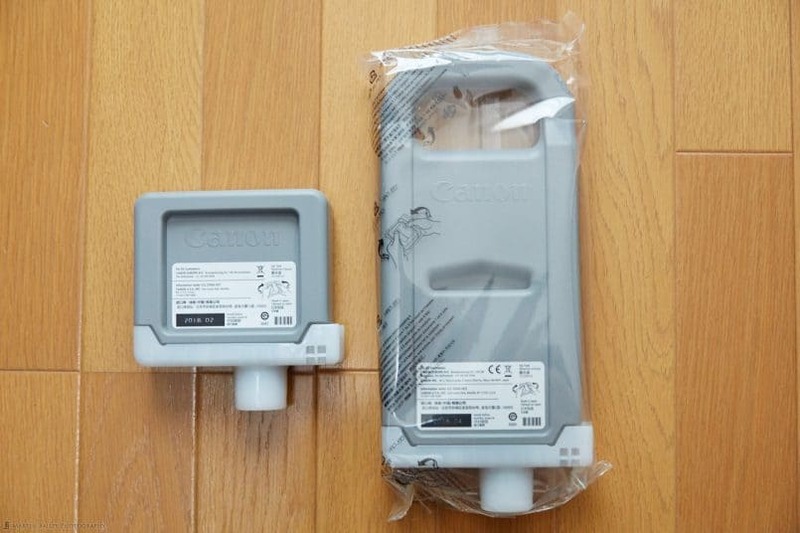 On the left is a 190ml cartridge, and on the right is a 700ml. I have also bought some 330ml cartridges, and was going to include one in this photo too, but they are actually the same size as the 190ml cartridge you see here. The only difference is that they aren’t as heavily indented as this 190ml cartridge. You see how it is inset where it says Canon and the white label is? The 330ml cartridges don’t go in that far, that’s the only difference. Over the last six years that I’ve been using my old large format printer, I’ve found that because I do a lot of black and white printing, the Matte Black and Photo Black, and the Gray inks tend to run down the quickest, so I have bought a 700ml tank for the Matte and Photo Blacks and the Photo Gray. So that I could show you the difference in size though, I ordered a 330ml Gray, for comparison with the starter inks, only to find they were the same size, as I just mentioned. I also bought a 700ml tank for the Chroma Optimizer, because I’ve heard this runs down pretty quickly. At a little more than $300 a pop for the 700ml ink tanks though, I think I will be avoiding using 700ml tanks for all but the heavy usage blacks and grays, unless I start to take quite a few more regular print orders that is. The good thing though is that we now have this option, and being able to mix and match tank sizes is great! 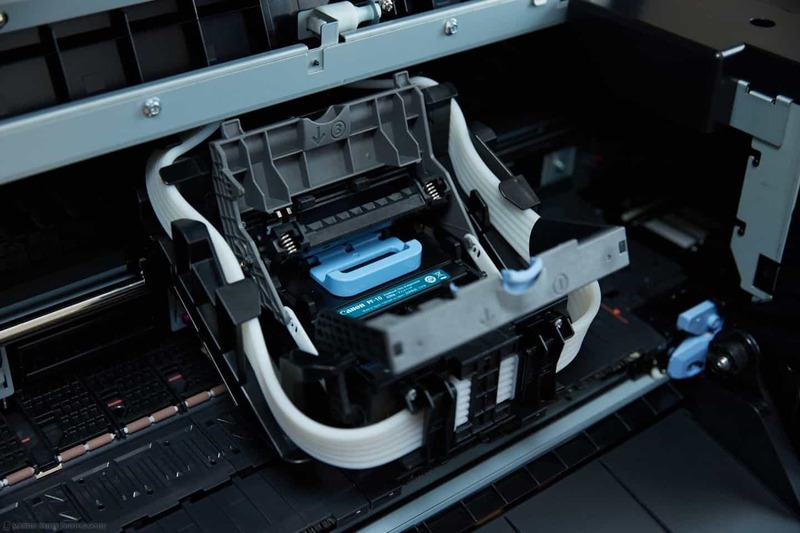 Another great new feature is that the inks are now drawn down into a Sub-Ink Tank System, which allows all of the available ink in a tank to be used before having to replace it, to reduce wasted ink, and better still, empty tanks can now be replaced on the fly, without stopping the printer. I haven’t tried this yet, but that’s what the documentation says. The PRO-4000 has a new multi-positional basket that can be adjusted to various configurations. With my iPF6350, where the basket was basically just either stowed, or out, ready to catch a print as it is cut from the roll, I never once allowed a print to fall into the basket. To avoid scuffing the face of the print, I would always wait until the print had come far enough out of the printer so that it would fall over the edge of the extended bar, leading the print away from the printer to prevent curling. Then, when the print was cut away from the roll, I’d be waiting to catch it. You can still do a catch basket configuration on the PRO-4000, but also what Canon call flatbed stacking, and my favorite, which is the slope configuration, which you can see in this photo (right). Although it’s kind of lost with the 18 x 24 inch print shown here, the slope allows the print to be guided away from the printer, and I always go to the printer by the time it’s going to be auto-cut, and catch the print, rather than letting it fall away. Before we move on from the physical differences, of course, there is the addition of the red line that Canon use on their “L” lens range, to mark that they are the top of the range. This is marketing, but it’s an important statement from Canon, that they have made these printers with their highest standards. One thing that I disliked about my old printer is that the Accounting Manager software was only available on Windows, but that’s changed. Now it’s also available for Mac, so I can now track how much ink and paper is being consumed for each print. You simply enter the cost of your various types of media and inks, and the software calculates the cost of each print you make. This is invaluable for pricing prints, but also, I print for other people sometimes, often with an hourly rate for my time, plus the cost of materials. Until now, I’ve had to start a Parallels session and open the Accounting Manager in Windows, but that’s clunky, so I’ve never liked having to do that, especially in front of the customer. Now I can just crank up the Accounting Manager and see costs instantly, right there on my Mac. Another new piece of software from Canon that I tried it their Print Studio Pro, which at first glance looks OK, but I noticed straight away that there was no way to enter specific border dimensions. I like to print my images at a specific offset, slightly above center, and to accomplish this in Lightroom or Capture One, I can enter in the dimensions of the borders down to a tenth of a millimeter accuracy. In Print Studio Pro, I can move the print around the page with my mouse, but that’s it. There’s no way to enter the border dimensions accurately. I may have missed this, but I searched for a while, and couldn’t find anything, so if it’s there, it’s well hidden. There are other new features, but you can see full details on the Canon Web site. These are just the new features and changes that I’m happy to see in the new PRO-4000, and these all apply to the PRO-2000 as well. The PRO-4000s and PRO-6000S are the new 8 color 44 and 66″ printers, which are not really suitable for fine art photography printing. Let’s take a look now at a few prints that I’ve already done as tests. First note that although I have bought some 44 inch rolls of Canvas all of my tests so far have been done using 24 inch roll media. I can’t wait to print something out that is huge, but not until I have an end purpose for the print. Anyway, after I created a custom ICC profile for each of my media types, I set about doing some test prints. As matte media is usually less forgiving than gloss, I started with the matte stock that I have. My favorite matte media is Breathing Color’s Pura Bagasse, which comes in both a Smooth and Textured version. 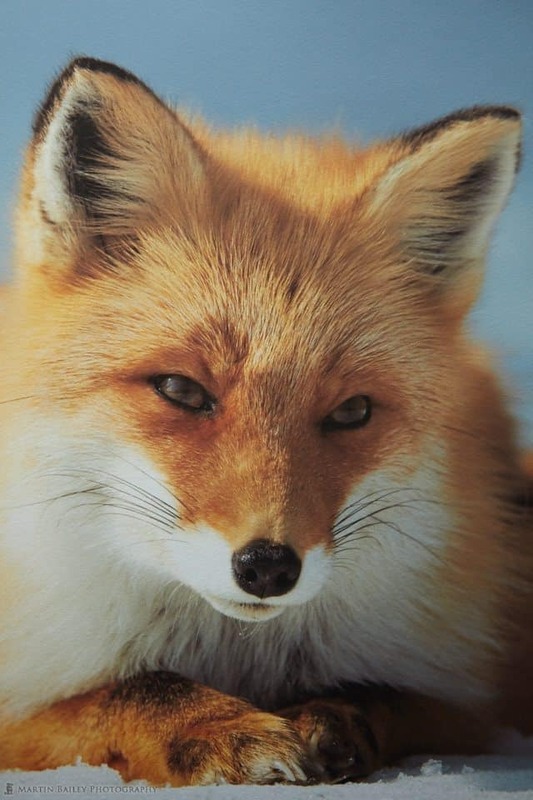 I printed this photograph of a Northern Red Fox on the Pura Bagasse Textured, and was very happy with the depth of the color and clarity of the image (right). This is a photograph of the print of course, not the original image. I printed this from Capture One Pro 9, so there is no point in comparing this to earlier prints, but there is a depth that was not really there on my earlier prints, especially around the eyes, where the clarity really comes into play. 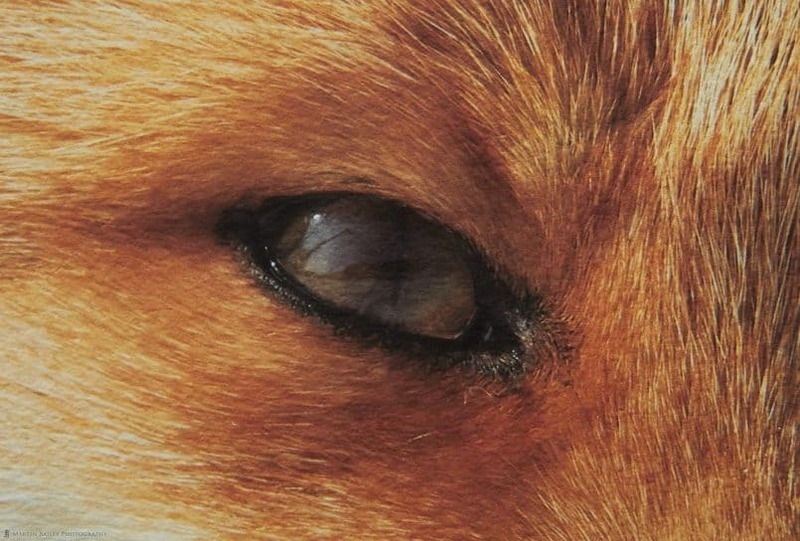 Here’s a close-up of just the eye, so that you can hopefully at least partially appreciate what I’m seeing (below). 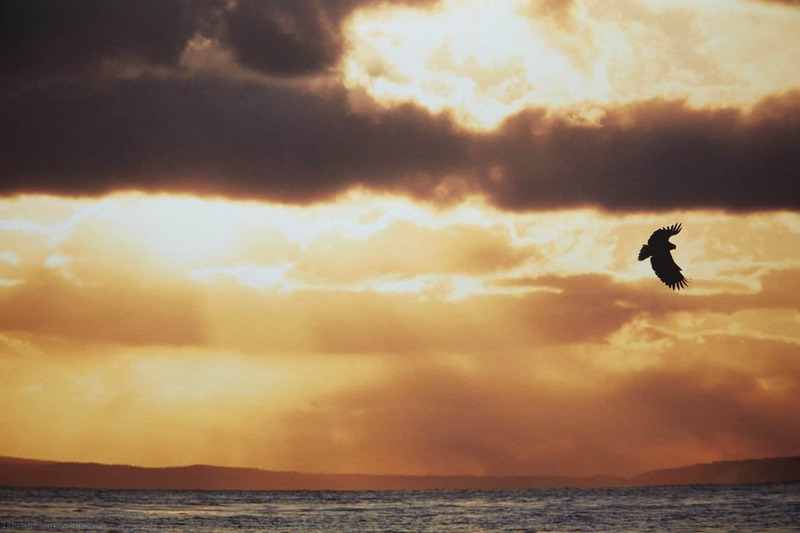 Note that this was a 7D Mark II photograph printed at 18 x 24 inches, so the resolution was around 250 ppi, which is enough for a print of this size, but not as well defined as a higher resolution image. I was happy with this first print, and I did a few others that looked great too, but the next print just didn’t really work under mostly the same conditions as I’d printed before. 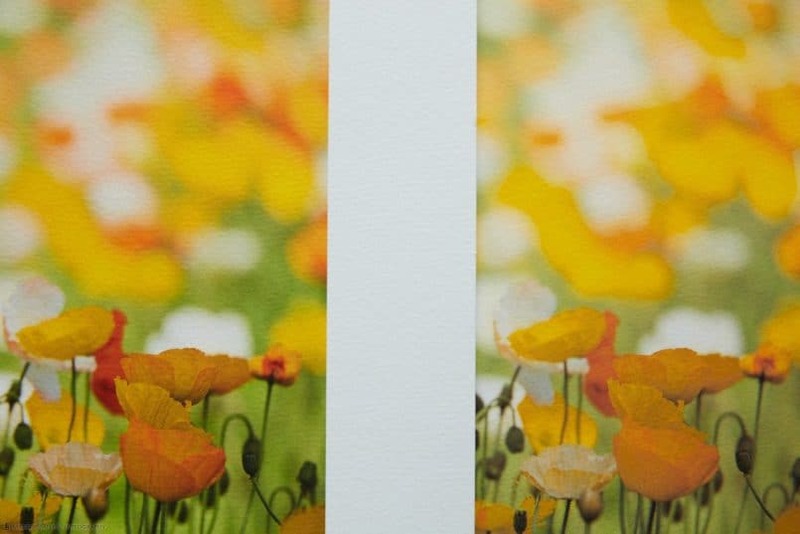 I showed how wide a color gamut the media had, by printing a photo of a field of poppies, that was actually way out of gamut. Now, given that there should have been no way to print the colors that were out of gamut anyway, this may seem a little bit harsh on the new printer, but having created an ICC profile in exactly the same way for each printer, the PRO-4000 simply doesn’t not handle this photograph as well as my old iPF6350 did. Here’s a photograph (below) of the same image printed on the same paper, with the iPF6350 print on the left, and my PRO-4000 print on the right. As you can see, the edges of the blotches of out of focus yellow have a nasty almost septic feel to it. The bulk of the yellow is what is out of gamut, and the printer has not handled the transition between that and the in gamut colors well. Like I say, the base photo is out of gamut, but this was the same for both printers, so this indicates to me that the PRO-4000 doesn’t do as well as the iPF6350 in this situation. In all other respects, I think it’s kickin’ but here, I was a little bit disappointed. I also did a lot of Pura Bagasse Smooth matte prints, and here is an example of one of these (below). I chose this shot because those transitions from very bright areas of the sky at sunrise, as they transition to the darker clouds, can often be a bit troublesome to print well, but these came out beautifully. Very natural transitions. Also, note just how dark the eagle is. Matte paper can sometimes lack really deep blacks, but this is not a problem for the PRO-4000. As you can also see in the next photograph, the dark areas behind this young Himba girl in the left print are also beautifully dark (below). The print on the left here is again on Pura Bagasse Smooth, a matte media. 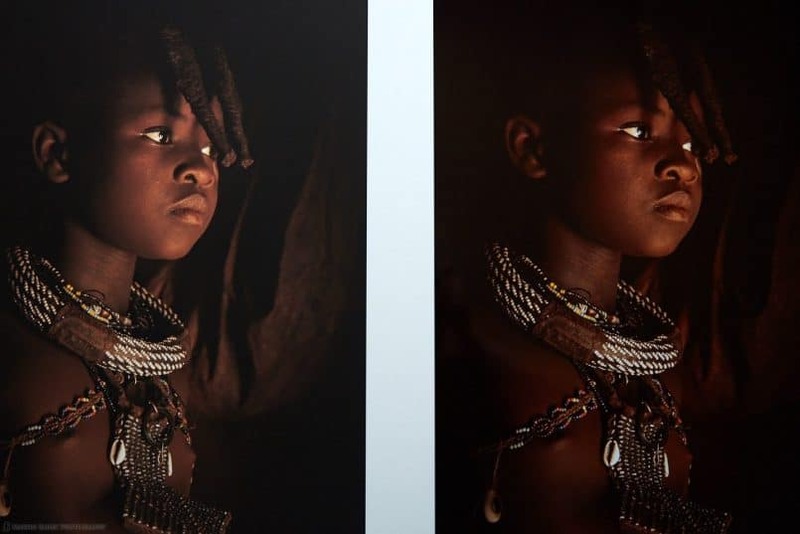 The photo to the right here though (above) was printed on Breathing Color’s Vibrance Metallic media, which is a metallic gloss paper, and that means it also has Canon’s new Chroma Optimizer applied during the printing process. 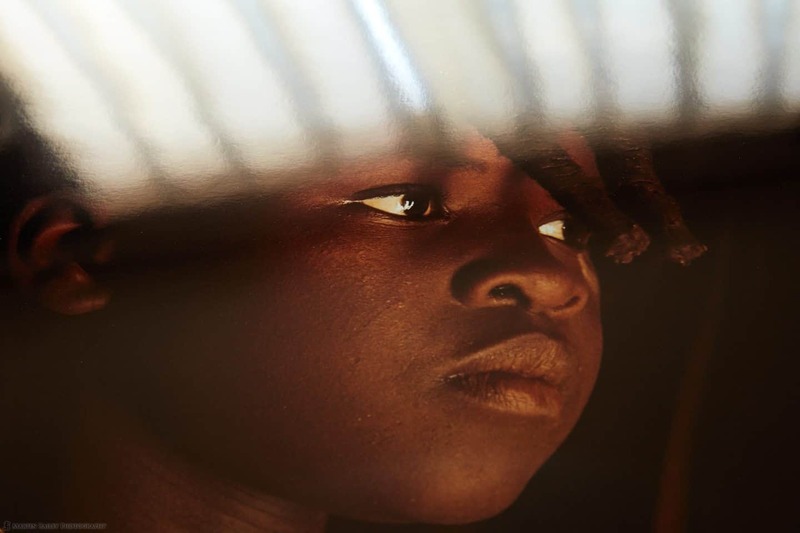 This may not come across in a photo, but here’s a photo of the Himba Girl print at an angle (below) looking towards the light. I hope you’ll be able to appreciate that the gloss photos from the PRO-4000 are absolutely outstanding. They are totally smooth, looking very much like a traditional darkroom print. They just don’t look like inkjet prints. Do keep in mind though that this image was shot at ISO 5000 so there is a little bit of visible grain in the original, rather than the print. I also printed this photo of some roses with a totally black background, and the depth of the black is just wackily beautiful (below). You can perhaps see a little bit of color in the print, but that’s just reflections from the room. OK, so, that’s about all I have for you on the PRO-4000 at this point. Although it looks like I have to do a little more soft proofing and adjustment for out of gamut images than I have done in the past, I’m very happy with this new printer. The 44″ width is going to allow me to fulfill more orders for large prints directly, which is great. 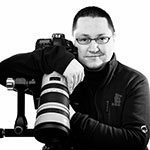 Until now I’ve had to work with third party printing houses for prints larger than 24 x 36″ but now I can go up to 44 x 66″ or even wider for panorama shot, so this opens up new possibilities for me and my customers. This review was created totally independently, without any help financially or otherwise from any third party. I paid for the printer myself, at the regular price, and Canon provided no help on the technical details, other than what I gleaned from the product documentation and first hand use of the product.